Yves Béhar's studio Fuseproject has created a television for Samsung that is indistinguishable from a framed artwork when hung on the wall. The Frame is a smart television that is designed to "disappear in the décor". It sits flat against the wall and displays artworks when not in use – turning completely off only when nobody is in the room to appreciate them. Béhar, who previously worked with Samsung in 2015 to design a sculptural television, looked at the visual presence a television has in a room, and how he could make it appear less obvious – particularly in smaller homes and apartments. "In our smaller homes and apartments, when a television is off, its black square takes up valuable real estate," said Béhar, who unveiled the TV at a launch event in Paris today. "Rather than designing a product that only comes to life when watching entertainment, we began to think about a display that offers new inspiration in our lives," said Béhar. "What if the TV display in my home delivered a different experience? What if the TV disappeared in the décor when it's not in use?" 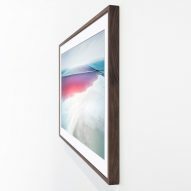 The Frame can be wall-mounted and framed with different materials so that it blends into the home decor. For the design, Béhar consulted framers from some of the world's most prestigious museums. The television's frame is available in white, black and wood veneer at launch. When the television is turned off, the display goes into Art Mode rather than going black. In this setting, users can explore art by artist or genre and can select a series of pieces to be displayed. They can also display their own artwork or family photos. For the Art Mode function, Samsung enlisted the help of curator Elise Van Middelm. She brought on board a number of artists, including Luisa Lambri, Barry McGee and Todd Eberle, who each had works converted especially for the screen. Each artwork is scanned and converted into a digital format, and is shown with different coloured mounting options according to the artists' preferences. In addition, the brightness sensor adjusts the image based on the room lighting, so that the artworks appear physical as opposed to digital. "The result is art that blends in the environment in the same way that printed photography or a painted canvas would look," said Béhar. "When you buy The Frame, you are also investing in these artists – pulling work specifically for this display". Samsung claims The Frame is the first display that uses sensors to adapt to its changing environment with automated brightness. This means that power isn't wasted unnecessarily, as the television switches off when it detects that nobody is present. Béhar's studio Fuseproject regularly designs gadgets like juicers and set-top boxes, as well as robots. The Frame follows on from the Bouroullec brothers' Serif TV for Samsung, which was unveiled in 2015 and similarly designed to fit better within the home, compared to the black and metallic products that currently dominate the market. Bouroullec brothers' Serif TV for Samsung "does not belong to the world of technology"